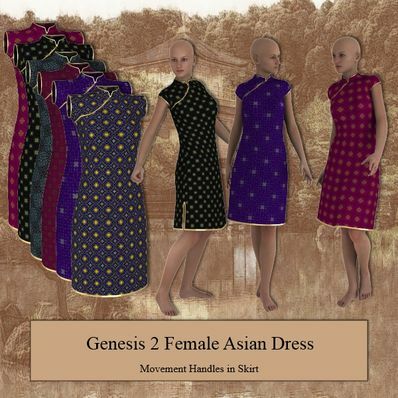 An Asian style dress for Genesis 2 Female for use in Daz Studio 4.6. Awesome, not too many Asian clothes available out there. These are great. Thanks so much..
Fabulous oriental dress, just beautiful work. Thank you. A very nice dress, and perfectly fitting! Thank you! Thank you Wendy Beautiful work as always. Really beautiful Dress! Thank you so much! Thanks again for the Modest style. It is appreciated and will be used. Thank you for this great style dress and lovely textures! As always nice and usable in many different environments. Beutiful Dress, thank you for sharing!